Colorful drinks are all the rage, but most of them are gut bombs. 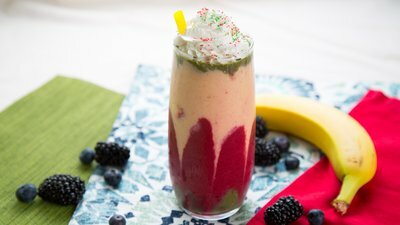 Cool down with this warm-weather-inspired smoothie. From Starbucks' Mermaid Frappuccino to Dunkin Donuts' neon Energy Punch, the summer 2017 drink trend seems to be led by two key descriptors: bright and bold. But with most of these drinks being offered for a limited time only—and most of them containing way more sugar than protein—they're only a treat to be enjoyed on occasion, if not avoided altogether by serious fitness folks. If you're feeling left out, good news: You can sip on a burst of color anytime with our tropical blossom protein shake. The combination of coconut cream, blackberries, vanilla, mangoes, and orange juice will tantalize your senses and help the flavors of summer spring forth. The added 32 grams of protein doesn't hurt, either.